At the risk of overgeneralizing, it’s an automated Docker management platform. 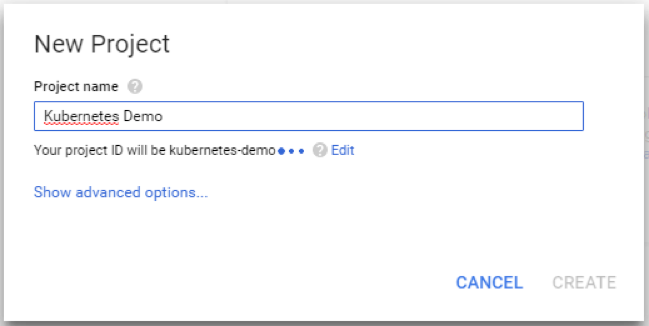 Now, let’s take a look at how at how to get your containers integrated with Google Container Engine and Kubernetes. Believe it or not, getting your feet wet with Kubernetes doesn’t require a massive architecture or complicated application. All it takes is a Docker image and a Google Cloud Platform (GCP) account to use with Google Container Engine. In order to get started, we first need to log into our GCP account and create a new project. Once we have a GCP Project, we can actually start digging into Kubernetes. The first thing we need to do is create a cluster. In Kubernetes-speak, a cluster is a collection of nodes, which in turn are collections of pods, which themselves are collections of containers. 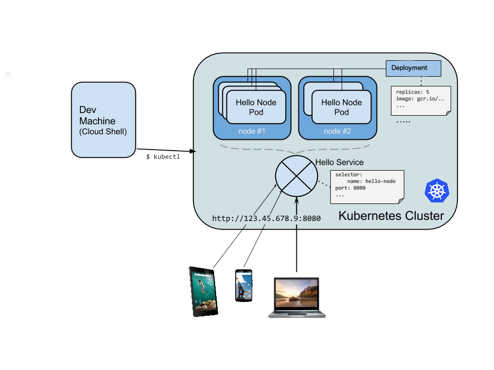 To put it more clearly, a cluster is the base Kubernetes service, nodes are like servers, and pods act as applications. 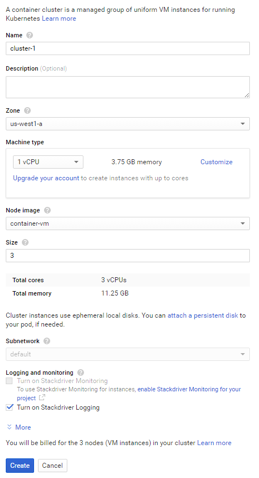 To create a cluster, head on over to the Google Container Engine (GCE) and click the obvious button that says “create a container cluster.” This will pop up an incredibly straightforward form that will allow you to enter in some details about your new cluster. For the purposes of this demo, the default settings are more than sufficient; however, I recommend hovering over some of the question marks to get a better idea of what each individual setting means. After we create our cluster, we then need something to deploy on it. Because Kubernetes is a container automation platform, the application we deploy will come in the form of a Docker image. For the sake of simplicity (and to keep the focus on Kubernetes), I’ve created the world’s simplest Dockerfile by importing the yeasy/simple-web image. For the sake of continuity, we next need to build the Docker image from the Dockerfile. This can be done via the docker build -t organization>/image-name command. Next, we need to upload our Docker image to the Google Container Registry (GCR). Before we can do that, though, we need to install the GCP Cloud Tools application. The details of doing this are outside the scope of this article, so I recommend heading over to the Cloud Tools download page and following the instructions for your operating system before continuing. Once we’ve installed and configured Cloud Tools, it’s time to push up our image to the GCR. This command will look similar to any docker push command, but will be prefixed with the gcloud command. This bootstraps authentication for us, which makes pushing up new images incredibly straightforward. Now that the necessary pieces of our puzzle are in place, it’s time to launch a node with our recently uploaded image. The first step to accomplishing this is to get the login credentials to our initially created cluster. This step is important, as it allows us to run our authenticated kubectl commands. 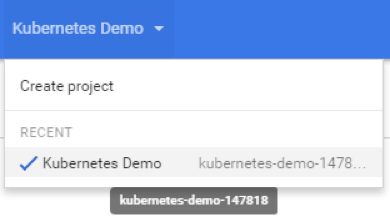 After fetching the cluster data from GCP, we are now able to deploy a node to it using the kubectl run command. This brings up one node containing one pod running the designated Docker image. If everything goes well, we can list our deployments using the kubectl get deployments command, and we should see the node that we just launched. Unfortunately, we’re not quite done. Our recently created node can only be accessed via an internal network, which means that it doesn’t do the rest of the world much good. In order to make our application accessible to the outside world, we need to expose our defined ports. Give it a few minutes and run the command again. When the public IP has been allocated, it will replace the field in the services response. If everything goes as expected, we should be able to navigate to the provided external IP address and our previously defined port in a browser and receive the simple web response! While Kubernetes is a bit more complicated than typical serverless architectures, it isn’t anything to be scared of. Getting started is really as simple as setting up a cluster and deploying a new node. The Kubernetes lingo can be a little confusing at first, but like any new technology, it’s just a matter of practice. With its automation capabilities, and direct Docker integrations, Kubernetes is the perfect platform for building scalable and highly available applications with minimal overhead.